Something happened to me. Some strange, metamorphosis occurred changing me from a goal oriented, type A personality, to a slug. Not just an ordinary slug, a lie-a-bed slug. I could have jumped out of bed and traipsed all over the city getting into all sorts of mischief, yet I chose not to. Now I could have just snuggled into the rather comfy bed and stayed there; however, then I would have run the risk of missing the amazing ham and cheese crepes my host was making. I don’t know about you, but homemade crepes, with melted cheese oozing and bubbling is not something I’m about to turn my back on. I may have been driven from my cozy nest with the need to satisfy my hunger, but that in no way meant that I was going to get dressed. Nope. Nuh huh. I stayed in my jamies. Shocking, I know. Further, I decided that, as it was so late in the day, we might as well just pull out a deck of cards and make it a game day. Not just any card games, mind you, oh, no! It was most definitely time to commune with my inner geeky game girl and play Magic the Gathering. We played a round, and I got spanked. I don’t mind losing, but that wasn’t just losing, that was humiliating. Seeing the cards that I was up against, I needed to fortify my arsenal! I wanted spells! Not just any spells, oh, no – I wanted spells that would neutralize creatures and wreck havoc on my opponent’s life force. Sadly, I’m not skilled enough to figure out how to find what I’m looking for or how to integrate these coveted spell cards into my deck. Happily, my host did. So, off to the comic book store (that also sold MTG cards) we did go. The gent behind the counter was rockin’ a sweet fedora. When I mentioned that I thought he looked stylish in said chapeau, the older lady behind the counter took another look at him. She and I decided that yes, he is handsome and winsome. I purchased my selections and we marched right back home again so that I could try and avenge my honor. We bought some pretty trippy cards, but I ended up not using them. Something about the walk to the store combined with chatting and flirting with the staff infused my card sharp skill with cosmic mojo. Seriously, I whipped the pants off my opponents the next two rounds! Yeah, I was feeling pretty sassy. Or was that hunger I was feeling? Perhaps quite a bit of both. Time to brave the cold, cruel world and forage for our dinner. 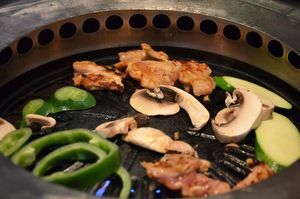 We moseyed to the Korean BBQ place within walking distance – wow, I think I could get used to being within walking distance to everything – where we bellied up to a table, and I promptly ordered a beer. Well, ya gotta start somewhere, right? We dined at Seoul Chako Montreal. They served all of our requests i n small bowls, which we then cooked at the inset grill at our table. Totally cool! I know, I have this fascina- tion with diminutive things. You can imagine the field day I had in a restaurant that served me fresh foods in small, cute dishes. It’s like playing in my own doll house. Anyway, the fresh veggies, marinated meats, and steamed rice were delicious. We enjoyed cooking at our table, sharing tasty tidbits, and chatting amiably. If you haven’t had a chance to sample Korean BBQ, I highly recommend that you do. After dinner (we closed the place) we took a slow stroll to Juliette & Chocolat, where we topped off the evening with a sweet treat. There is nothing like thick, rich, and creamy hot chocolate. Until I tasted the amazing beverage that was served to me, I didn’t know what hot chocolate was. I ordered the Mangaro 65% – Madagascar, which the menu indicated was cultivated on a former mango plantation, tastes of mango. Hints of gingerbread and citrus fruits. Oh, myy! Yes, this! This! A thousand times this! 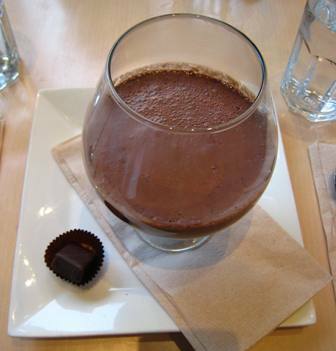 Why or why isn’t there a Juliette & Chocolat close to where I live?!? It’s just wrong to introduce me to the garden of chocolate Eden and not let me stay there forever! Fine, just fine! I’ll make another annual migration to Montréal and have hot chocolate every day! The chocolat looks yummy! And no, I am so not surprised that you were still in your jammies. Woman after my own heart.